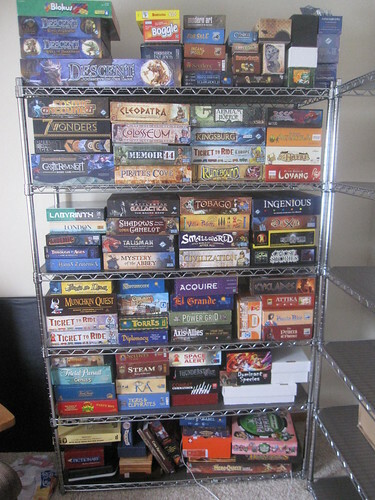 In a corner in my office on a single shelving unit rests a collection that I’ve been building for fifteen years, my board and card game collection. The collection has been built from a lot of sources: gifts, trades, thrift store finds, ding-and-dent sales, and contest winnings make up a significant portion of what you see, as do more than a few of my own purchases. Here’s the thing with this collection, though: when I look at it, I don’t see a collection of stuff. I see a set of experiences: games played in the past, games yet to be played, and often, the choice of what game to play right now. I see a lot of time spent with friends and family around the table, talking about life, pondering the game a bit, and simply enjoying each other’s company. I see the friendships I’ve built over the years because of this collection – people I’ve played games with and used that opportunity to get to know them better and allow them to get to know me better. In January 2011 alone, I played 28 games off of this shelf. By the time you read this, I will have already logged a game or two in February as I’m planning on having lunch and playing a card game with a friend. This is a collection that gets used. This is a collection of experiences. Here’s the truth, though: it wasn’t always like that. Let’s take a look at that picture again. Do you see how there’s a second empty shelf on the right? Well, it’s nearly empty – there’s a single cardboard box on it that contains some stuff headed to Goodwill. Once upon a time, that second shelf would have been loaded with gaming material, too. You see, it wasn’t too long ago that I was more of a collector than anything. I would go into thrift stores and buy any board games I could find. I would receive a game, play it once, decide I didn’t like it, but then just add it to the growing mountain that was my collection. I was an avid collector of several types of trading cards, and I used to buy quite a few games, too. At some point, it all became overwhelming. I had lots of games that sat around unplayed and instead of actually playing them, I would go hunting at thrift stores and other places for some great undiscovered item for my collection. Why? I had completely lost touch with the reason why I had such a collection to begin with, which was to play with friends. I finally begain to realize after a while that it had gone from a collection of great experiences to a collection of stuff. It had moved from a wonderful collection of shared experiences that I could indulge in quite frequently to being a self-absorbed chase for more accumulation that actually stood in the way of actually enjoying the games themselves. Over the past few years, I’ve pared things down substantially, even as friends and family have gifted me new games. I’ve sold off quite a few games and traded many, many others for different games, ones that I picked up solely with the thought in mind of how likely they were to be played with the friends I have. My reward, in the end, is a smaller volume of stuff, but what remains has value. I don’t have to dig through overstuffed shelves to find games – I can see everything I have at a glance. My focus is on playing the games rather than accumulating more. Perhaps best of all, it’s now quite accessible for everyone to just grab a game if they want to play rather than being crammed in with many of the games being trapped behind others. It went from being a big pile of stuff to an easily-accessible grouping of experiences. If I turn that type of perspective to everything in my home – the idea that something that isn’t accessible and isn’t being used with any regularity needs to go – I find myself quickly getting rid of things. In fact, this type of purging has become something of a routine around here. About every six months, I’ll purge a lot of things – clothes, the contents of closets, and so forth. I usually pick some specific type of item or specific area and go on a purging. When I’m finished purging, I usually have a lot more space, a great pile of things to sell (or give away), and best of all, easy access (and less maintenace) of the stuff that I’m actually keeping. This gives me time to experience what I have instead of spending my time maintaining it or accumulating more. What about your own collections and storage spaces? Can you easily retrieve any item of your collection that you wish? If you can’t, why do you still have that item if it’s difficult for you to reach? How are you gaining value from that item if you can’t utilize it and experience it? Stuff gathers dust. Experiences live forever. Stuff costs money. Experiences just use what you already have. Experiences trump stuff, every time.